Keep your Wand ID at the ready for M.A.C.U.S.A. 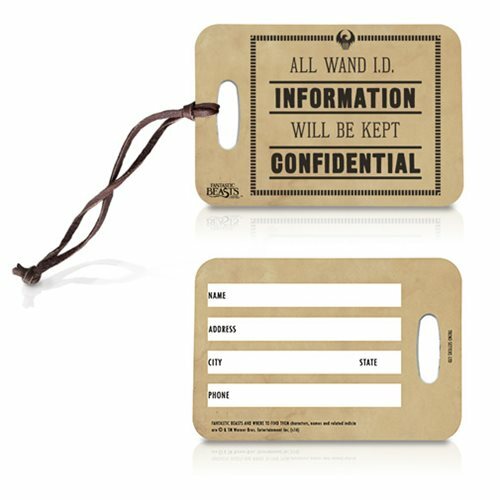 with this useful Fantastic Beasts and Where to Find Them Wand ID Luggage Tag. Made of fiberglass reinforced plastic with a UV resistant surface for increased durability, it measures 4-inches wide x 2 3/4-inches tall and can be used as a luggage tag, keychain, or zipper pull, depending on how you choose to show off your fandom. The wording reads "All Wand I.D. Information Will Be Kept Confidential." The reverse side is for your name, address, and phone number. Ages 14 and up.